My least favorite part of building the airplane has to be doing fiberglass work. That said, the amount on an RV isn’t really that much. Hopefully you can find something in here that will make the job a little easier or less daunting. There are two schools of thought as to when the right time is to do this work. I think it will depend on your circumstances. I didn’t want to do this work until I was finished moving, that way the additional pieces took up less space, and I didn’t have to worry about them getting messed up. But you may find it easier to do the tips and fairings as you build. And here are some other tips and techniques I picked up during this process. As you can see, I had only a few fiberglass parts to work. Did you have more to do on your project? 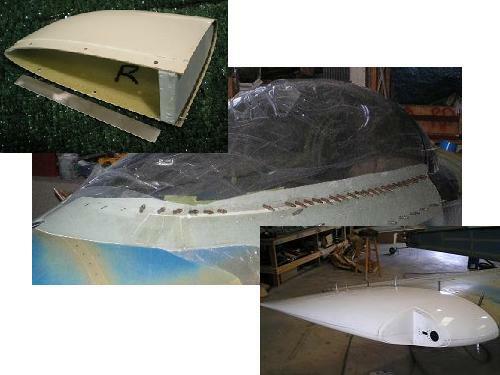 Did you build a fiberglass airframe? Share the things you did and learned with the rest of us. Kit Plane Advice readers want to hear your story. Tell us about laying up large pieces, tips on getting that perfectly smooth finish, how to make plugs that easily remove from the final piece, or any other fiberglass related topic. Or, if you want to ask a question about Fiberglass not already addressed here, please do so. Entering your Kit Plane Fiberglass story is easy to do. Just type! Do you have a picture that goes with your Kit Plane Fiberglass story? Great! Click the button and find it on your computer. Then select it. Maximum size is 800x600 pixels.